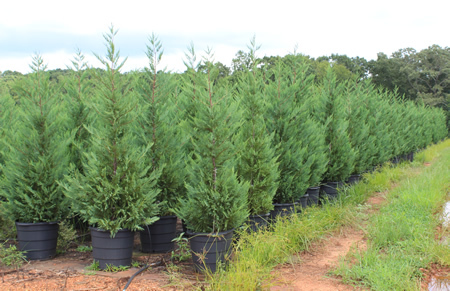 The Murray Cypress tree is a fast growing evergreen that is ideal for privacy. They grow an average of 2 to 3 feet per year and can grow to be around 50 feet in height and 20 feet in width. The Murray Cypress retains its green color year-round and is able to withstand hot and cold temperatures. These trees are more resistant to disease than the Leighton Green Leyland Cypress. The Leighton Green is what most people commonly refer to as a Leyland Cypress tree. They have a dark green color. These trees are not only used as a privacy tree for a border but also as a Christmas tree. The branches grow tighter than those of the Murray Cypress and have a flat, feather shape. Christmas tree farms will often plant these as the choose-and-cut trees in the field. The Leighton Green is perfect for planting as a privacy tree for a border since they grow over 30 feet tall. Although this tree does not have much of a smell, it can be helpful for those people with allergies.